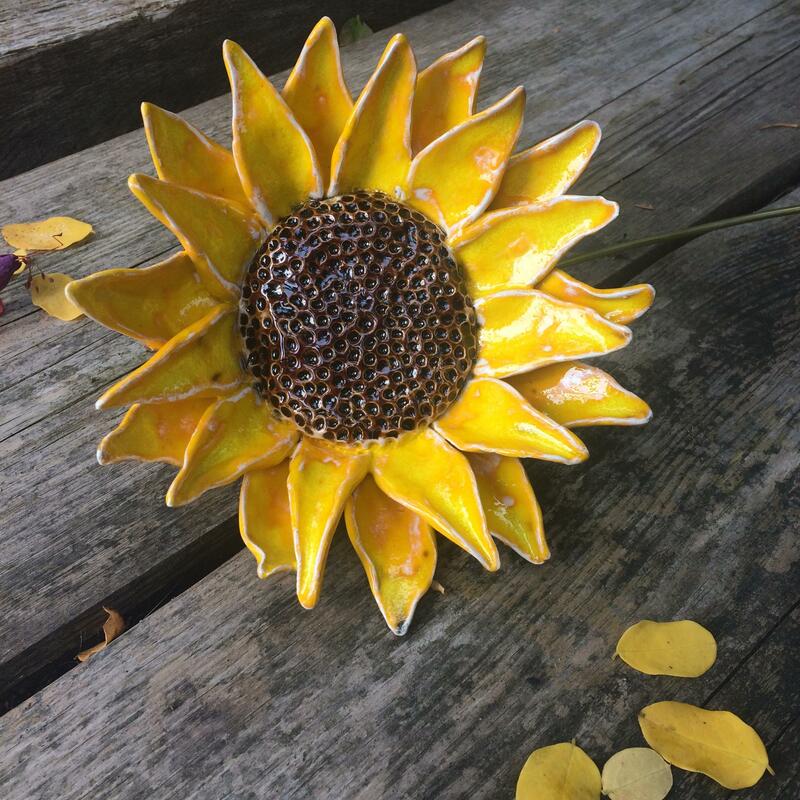 Every Sunflower created is unique, the petals are individually handmade and created from a high quality fine white clay, and then glazed in a deep yellow colour to produce a beautiful everlasting flower. Your Sunflower will look amazing in a vase to bring a blaze of colour to your table, on a shelf or cabinet and would make a spectacular handcrafted centre piece for a wedding bouquet or table arrangement. The ceramic glaze used to colour the Sunflower gives each flower a timeless quality which will never fade or age, the flower will always look fresh and bright in your display and brighten your room. The Centre of the Sunflower has been glazed a rich chestnut brown. Each flower is stamped with the designers mark. These handmade special flowers will make stunning presents for Mothers Day, Anniversaries, Birthdays or Valentines day. They will look beautiful a one flower or bought to make a bunch of 2, 3 or 4. A keepsake for any special day. If the flower is for a special occasion or for a special person a name, date or message can be applied on the underside of one of the petals to make it truly special. Contact me and we can discuss how i can create your bespoke Sunflower. I also create other flowers which are available to mix and match in your display. The ceramic Sunflower head is on a long hard wire stem so it is easy to arrange both in a vase or in a bouquet. Each flower head measures approx 15cm-20cm diametre, but every flower is unique so there will be a slight difference with each one. The Sunflower is bubble wrapped and boxed for delivery.